Stenciling has been around literally since the cavemen. But these days stencils have moved beyond the caveman and Grandma's kitchen into the modern day. There are so many great sources for uber cool pattern repeats and just about every style you can imagine. When cost is an issue, I like to cut my own stencils. It's pretty easy to do, you just need a pattern and a good sharp exacto knife, plus the acetate sheet. I usually buy the blanks, they come three 8x10 sheets to a pack and I tape them together to get a nice big surface area to work with. Following, I'll show you examples of some of the stenciling I did around my own home, using stencil patterns I cut myself. 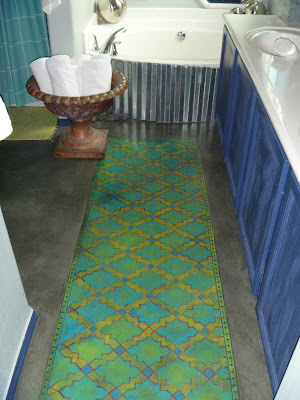 I stenciled this 'runner' on the concrete floor in my bathroom. 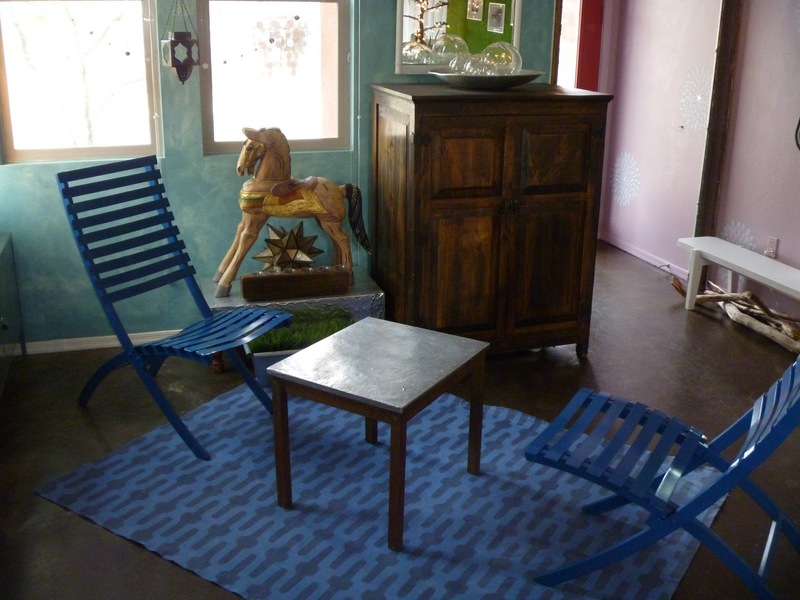 I stenciled this floorcloth in my living room. I stenciled the fabric on the small settee. 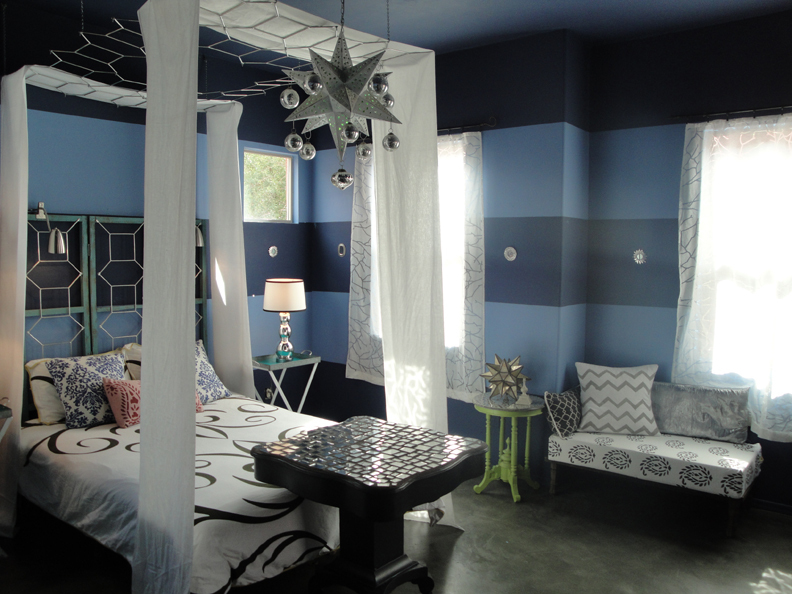 I stenciled the pattern on the roman shade and the storage boxes. 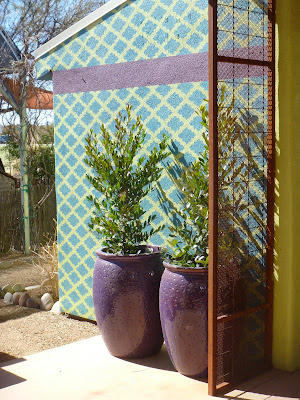 And this stenciled pattern in the garden helps bring focus to a back wall. If you look closely, you'll notice the stencil used for the 'runner,' the roman shade and this outdoor wall are one and the same. You can achieve a lot of different looks with just one stencil. If you have any questions, shoot me a comment and I'll get back to you. And here is my latest style file segment which I talk about....what else? Stenciling! Laura, you are sooo talented. I love what you've done in your home and the TV segment is super. I always love seeing your work. wow you did a great job, that bathroom runner and fabric settee are gorgeous! I'm visiting from Girl Creative. have a great weekend! Wow!! The bathroom floor is awesome! You will have to do a tutorial on that!! Looks amazing! I'd love to do this in a room in my house. You are right, there are some great all over stencil patterns available these days. Hi, Laura! I am almost positive I remember seeing your settee featured on the Nate Berkus show. Am I crazy? ;) I LOVE the roman shade. Beautiful work!! Thanks everybody! I appreciate your comments so very much! Hi Laura, I've enjoyed visiting your cool blog. I love your fresh perspective & fun projects. That floor runner is so awesome! Wow, you are so good at stenciling. Everything looks amazing. I am your latest follower. I would love for you to come and check out my blog and follow me back at www.diybydesign.blogspot.com. Thanks so much. Love your blog - I found you at the Newbie party. You are very talented and daring! We have different styles but I appreciate your eye and creativity. The color combination on the bathroom floor is very sharp. I'll be following you to watch more creativity unfold. Have a wonderful evening!I would love to have you visit when you get a chance. You are super talented! And patient! Thank you for your kind comment about my Pope post. I am glad you were touched. 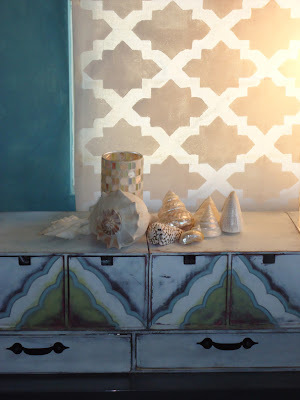 Love me some stencils...you are really brave and it all looks fantastic! I must have missed your link from the newbie party. Glad you joined. Next time please add my link so that others whom may not know about the party will:) Thanks. I myself have a Moroccan inspired room and I'm trying to add some flair to the walls. I'm looking into stenciling them but I have a question. When you make your own stencils, how do you get the design on to your stencil film? Do you draw it on free hand? I found a design I like but it's too intricate for me to free hand it. I don't see how I can trace it on to the film. Just wondering what it is you do to get the pattern on the stencil before cutting it out with the exacto knife. So Chic in So. Cal. A Heartwarming Tale: Stray Table Returns Home!